The Rangers have claimed infielder Carlos Asuaje off waivers from the Padres, per a club announcement. The San Diego club had designated Asuaje for assignment recently. It’s unclear just how Asuaje will fit into the Texas roster mix. He’s mostly a second baseman by trade, a position that ought to be filled regularly by Rougned Odor. Asuaje has also seen some time in the minors at third base, though Jurickson Profar presently profiles as the everyday piece there. All of these players hit from the left side, though Profar is also a switch-hitter, and have historically performed much better against right-handed pitching. It’s getting hard to keep track of who’s on waivers. I miss the limbo updates. I’m actually shocked someone claimed him. I think some team’s hoping he can be a viable 2B platoon option, with a nice walk rate and an OPS around .750. It’s possible if he can figure it out, but he put up big numbers in the pcl (hitters league) but during the 2018 season he looked completely lost in the majors. He looked alright in 2017. Not a stud by any means but .270/.334/.362 is good enough to be a backup. 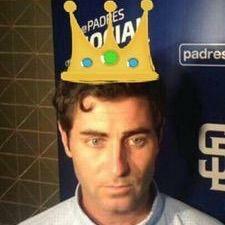 There’s some guys I wish the Padres had let go before him. At the end of the day though he’s probably a fringey AAAA player. The problem is he plays mediocre D at 2B and is below average at 3B so he’s not really super useful as a utility guy and he doesn’t really hit enough to do much else. Organizational depth…can fill a need. If he gets more than 50 games on your ML active roster, you are going to need a lot of studs around him to realistically make a run at the World Series. This guy was kind of a fringey AAAA player, but it was funny to see him accidentally expose Myers’ whining. Does his contract include a road buddy to game with? Kiner-Falefa at 3rd and Chirinos catching. Trade Profar. Either way your going to see Jon Daniels at his worst as GM in the Winter Meetings.